Mae Webb surveys her new ramp as Leif and Erik Jackson stand by and Erik's son Dylan tests things out. 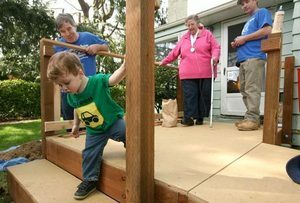 32 disabled people in King and Snohomish counties had ramps built to their homes Saturday during "Rampathon," an annual event organized by the Master Builders Care Foundation (part of the Master Builders Association of King and Snohomish Counties). "This is marvelous," Mae Webb said as she set foot on the new ramp to her front door. Until Saturday, when a volunteer crew of home remodelers built the ramp, Webb struggled to make it up her two front steps when she entered her house, because of her arthritis. Now it will be easier for her to go to her thrice-weekly dialysis sessions and her weekly volunteer job at the Greenwood Senior Center. She uses a wheelchair "on my bad days" — which are becoming more frequent. Because the builders designed her ramp with a landing large enough to function as a deck, Webb, 69, also will be able to sit outside and enjoy her garden and the squirrels and birds that visit her feeders. Her life improved because of "Rampathon," an annual event organized by the Master Builders Care Foundation, part of the Master Builders Association of King and Snohomish Counties. This year, in the largest effort yet, 450 volunteers built ramps at 32 King and Snohomish county homes whose disabled residents can't afford to pay the average market cost of about $5,000. During its 16-year history, Rampathon has built about 275 ramps. Master Builders, which also organizes construction of apartments for homeless families, is trying to arrange 100 service projects this year to celebrate its 100th anniversary. "It's a godsend, it really is," Webb said, praising Rampathon and Jackson Remodeling co-owner Leif Jackson, who designed her ramp, assembled the work crew and obtained donated materials, including a portable toilet. "Every one of our employees came out and volunteered, and other contractors that we're friendly competitors with, they volunteered," Jackson said. When he approached suppliers, he said, "As soon as I mentioned the Rampathon to people, they said 'absolutely.' They wanted to help." Teams of backup volunteers distributed breakfast and lunch to construction crews, picking up 90 pizzas from the Kirkland Costco. Narda Curlee, 61, whose career as a dance and gymnastics teacher was cut short by a 2007 auto accident, also received a new ramp. After several recent falls, she's hoping Medicaid will buy her a power wheelchair so she can safely shop and go to the nearby Kingdom Hall. "This is just wonderful," Curlee said of the ramp project. "The people with Rampathon are some of the sweetest people I've ever seen in my entire life." Webb's housemate and caregiver, Karen Cole, came home just before the builders finished screwing down the surface of the ramp. "Are we having fun or what? We have a deck!" she shouted to Webb. Jackson said he and his brother and business partner, Erik Jackson, have put together Rampathon teams for "five or six years." "I'm hopeful that Mae will be able to use this for years."